The high rated level of mediocrity, hypocrisy, mischievousness and ill-reflective inconsistency of these so called Igbo politicians and leaders, has become so bothering and irritating to so many lovers of truth and justice. How on earth can a right thinking man in these present segment and time of this expired country keep talking about restructuring and elections in Biafraland? An ultimatum has been given by the northern youths with the backup of their elites, yet these unscrupulous elements and educated illiterates cannot step down and see the handwriting on the wall. It is now dawn to me that many black folks are truly animals, just like when you ask a goat to go out of your yam ban, yet you see it going back there even more With its entourage. The same thing has become so much applicable to all these slaves. These inconsistent lifestyle has gone too far deceiving most of our little poor brothers who reside over there at North. The Northern elders in a few days ago was sending a strong warning to the Nigeria government and security agents not to arrest any of their youths, and if such thing should in any happen, that there would be a very big problem in the country. 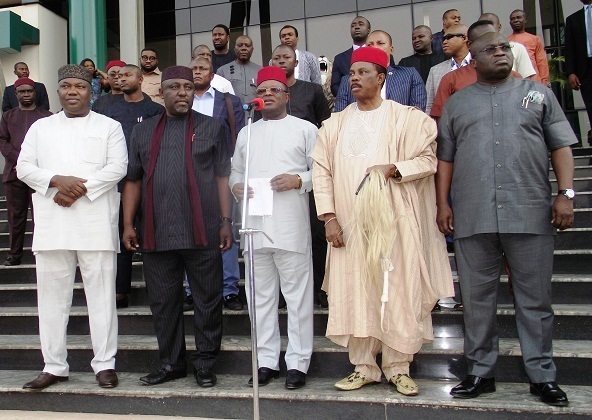 Then my question now remains, where are these so called Igbo leaders? Who are those even recognizing these people in Biafra land as their so called Igbo leader? Why are they flouting themselves around as Igbo leader? While they cannot protect the interest, lives, and properties of those they claim to be leading?. We have all these while been demanding for the state of our own to exist as a people and exit from the fraudulent contraption concocted by the whitish Britain, called Lord lugard. Yet these so called leaders are out there Jumping from one place to another seeking for negotiations and crumbs that could fall of from the master's table. What a looming shame, what an undesirable attitude by all these people. The only thing I observed, is that these illiterates called leaders are not being sensible enough to understand the main reason behind where we are today. They keep selling off their birthright, its a big shame to them all. These same illiterates have gone so far as deceiving our poor little brothers, who have businesses in the north by assuring them protection if necessary, If they were capable of protecting our people, why weren't they able to protect us on 30th may 2016 in Anambra, when we were being killed? Why weren't they able to protect us at the streets of Igwe Ocha? This is the more reasonable questions that Kept bothering my mind over the lifestyle and inconsistencies of these so called Igbo leaders and politicians. When the time comes now, they all will leave the people behind and look aside. Infact any Igbo leader or politician, identifying his or herself with the Nigerian government and politics, is a corrupted person. How ever, how on earth should a person like Mallam Rochas Okoro Hausa, be organizing a negotiation meeting with the leader of the indigenous people of Biafra and APC chieftains? After all, they did to him at kuje prison, all their tries for negotiation with him over there which he refused, yet these defaulted Hausa-Fulani philanthropist, Mallam Okorocha, has again decided to call up a negotiation meeting with him again. Doesn't these prove that this mere philanthropist is really not in his right senses? To be sincere, I am so ashamed to have such kind of person in Biafra land. If I should suggest, I think these man should be taken far more to where he belongs. Biafra is not in for a mere Nigeria negotiation or politics. All Igbo politicians and leaders should have these sunk down into their consciousness, we are whiter than white and whiter then snow. Any one thinking of restructuring or election in Biafra land must be joking. There should be a clear thought from all these politicians and leaders over what we the Biafrans are seeking for, we do not need any other thing from the zoo and the entire world if not our Referendum. If they are clearly seeking for a way of solving the current problem of agitation and self-determination, the must, first of all, acknowledge this idea of Referendum for peace and absolute tranquility to reign in these very part of the world than playing with them. They should also have it in mind that, all the agitators are truly determined without any form of joke. They should conduct the referendum and first see the out come, then they can now talk about the referendum. Finally, you can not violate the right of a particular set of people and still expect them to remain law abiding and patriotic to a fallen country. So I suggest that Government of Nigeria should grant Biafrans there wish and let them go. If they can't do so just like that, then there should be a referendum conduction before they can talk about any other thing.